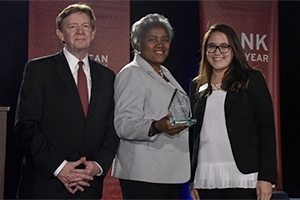 Brazile (center) accepts the 2016 Wonk of the Year Award from President Kerwin (left) and KPU director Valeria Ojeda (right). If you’ve seen Brazile on TV, you know that she’s highly quotable. So it’s best to let her do the talking. Without further ado, here are 10 memorable quotes from Brazile at AU.